Some of the most popular Gems are utilities that make it easier or more convenient to arrange windows on your screen—for example, to place a word-processor window in your favorite location, to line up two Finder windows for easier file management, or to stick a Web browser and a text editor side-by-side to preview some Web code. (I find these utilities to be especially useful when using a trackpad, which, because it's less precise than a mouse or trackball, makes such actions a bit of a hassle.) Last week, I reviewed Moom, and I’ve previously covered Cinch, TwoUp and SizeUp, MercuryMover, Zooom, MondoMouse, and Fiwi. But there are still a number of nifty utilities out there that make it easier to manage your windows, and I’m going to be covering the best of them over the next few weeks. Today’s Gem-worthy tool is Misage’s Divvy. With Divvy running, whenever you want to resize a window, just click Divvy’s systemwide menu-bar icon or press its configurable keyboard shortcut (I chose Control+Shift+D). Up pops a semi-transparent grid—by default, displaying six columns and six rows—representing your Mac’s display. Click and drag your cursor across these boxes to choose the desired window size and position—you’ll see a useful blue preview box on the screen, indicating exactly where the new window will end up—and Divvy immediately resizes and positions the selected window to match. A nice touch is that if you’ve got multiple displays, Divvy’s interface appears on each screen. If you want to resize a window and move it to a different screen, you just use the Divvy interface on the desired screen. Divvy will resize the window and move it to that screen. By default, Divvy’s interface disappears as soon as you choose your desired window size and position. But you can choose for Divvy to remain on the screen until you dismiss it by pressing Escape or clicking Divvy's close button. 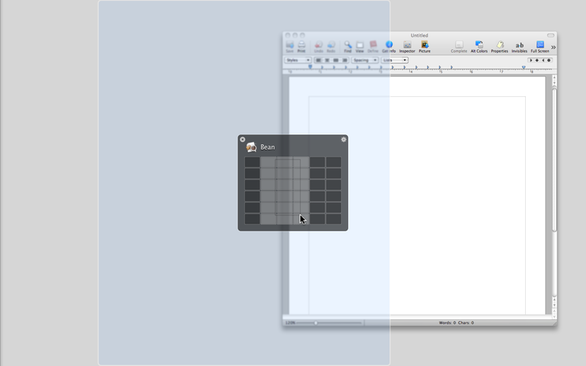 This approach is convenient for resizing multiple windows consecutively. Divvy’s default six-by-six grid works well, as it makes it easy to fill a display with two half-screen windows (arranged top/bottom or left/right) or three third-of-a-screen windows (arranged vertically or horizontally). But if you want more flexibility, Divvy’s setting screen lets you independently increase—up to 10—the number of columns and rows. Alternatively, if you only occasionally need finer resizing and positioning increments, pressing Command+ or Command-Shift-+ (the Plus key) lets you add—just for the current resize/reposition actions—additional rows or columns, respectively. Similarly, holding down the Option key doubles the number of columns and rows for that specific resize/reposition action. Unfortunately, the latter (Option-key) feature didn’t work for me—the “doubled” grid would briefly appear, but would disappear before I could select a window size and position. It’s possible this was due to a conflict with another utility running on my Mac; it would be useful if Divvy would let you choose a different modifier key. Divvy also lets you configure keyboard shortcuts for frequently used window sizes and locations. For example, you could set up Shift+Control+L for a half-screen window positioned against the left-hand edge of the screen, and Shift+Control+R for a half-screen window against the right-hand edge of the screen, making it easy to fill your screen with two windows side-by-side. (With multiple displays, Divvy offers an option to cycle the selected window between displays by repeatedly pressing a shortcut.) These shortcuts can be Global, which means they work at any time, or Divvy-only, which means they work only when Divvy’s interface is visible. The latter approach reduces the chances of shortcut conflicts between Divvy and other programs, and it also lets you use shortcuts that are easier to remember—for example, L for left and R for right. In some ways, Divvy is similar to Mac OS X’s standard window-resizing action—you must click and drag to resize and reposition windows. But instead of having to use precise cursor movements to click-drag a tiny resize corner and, subsequently, to stop at a specific target size, you can make much coarser cursor movements to choose your desired size and location. And you can resize and reposition with a single action. One other feature I’d like to see is the capability to restore a Divvy-fied window to its original size and location. (The developers have said they’re looking into such a feature.) Finally, I wish you could adjust the transparency of the Divvy interface. Especially on the settings screens, I find the text difficult to read with certain backgrounds. But these are minor issues that don’t prevent Divvy from being a clever and intuitive alternative to dragging title bars and tiny resize corners. And once you've used Divvy's grid to move and resize windows, OS X's standard methods of performing these actions feel a bit primitive.